Have thought of converting your large storage capacity Blu-ray videos to H.265 to save more free space without losing the high-quality? Trying to find an easy-to-use H.265 Encoder? If so, in this article, we will introduce a powerful Blu-ray to HEVC/H.265 Encoder – Pavtube BDMagic and show you detailed guide on how to convert Blu-ray to high-quality videos HEVC/H.265 MP4 video on Windows 8.1/8. 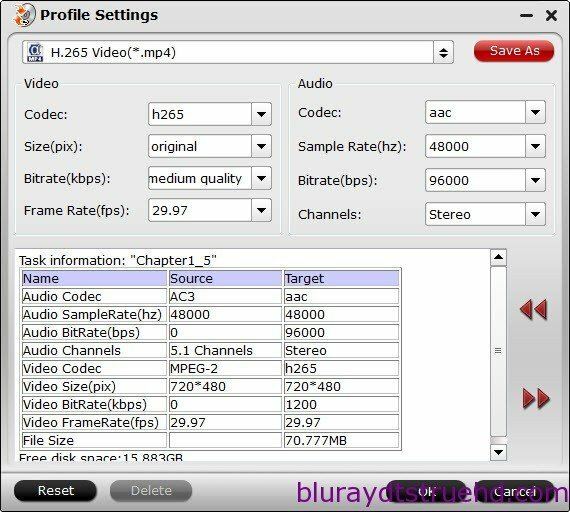 Launch the Blu ray to H.265 converter; click the “File” button. From the sublist, click “Load from disc” or “Load from folder” to load your Blu-ray movie from disc or folder. Click Format bar to get the format list and select a proper export format. Common Video > H.265 Video(*.mp4) is the proper choice. You can click Edit button to trim your favorite part from the video, crop video frame size, adjust visual effects, add watermarks, subtitles and more to personalize your videos. Plus, click the Settings icon, you can adjust the video size, frame rate, bitrate, etc. When all the settings are OK, you can click the “Convert” button on the main interface to start converting Blu-ray to H.265 MP4 video. After the conversion, click the Open button to locate the resulted videos for H.265 video playback. Pavtube upgraded ?softwares can spare no efforts to produce users the simplest video expertise in accordance with the latest technology all identical. With Pavtube BDMagic, you can also convert DVD to H.265 MP4 files. NEWS!!! Recently, Pavtube Studio has upgraded its top-ranked Pavtube BDMagic to version 4.9.0.0 with supporting the most advanced hardware acceleration NVIDIA CUDA & AMD APP by H.264/H.265 codec, which can give users 30x video transcoding speed than before.